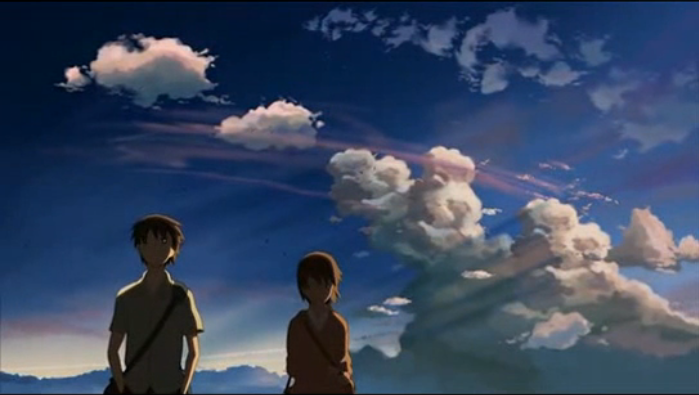 Extraordinary skies are a staple of Makoto Shinkai's work. 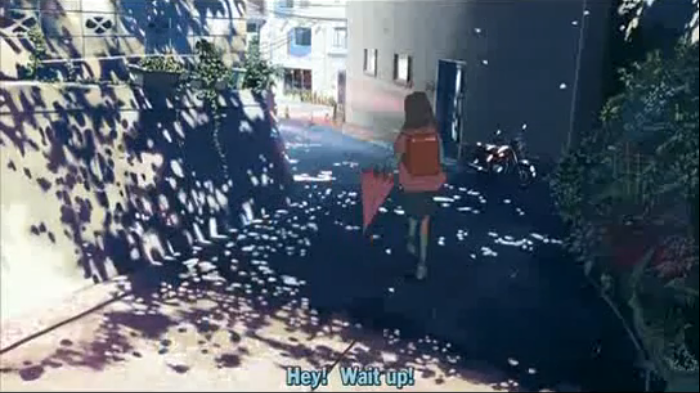 5 Centimeters Per Second is a fairly short film made by Makoto Shinkai. Like most of his other work it examines the way humans deal with loss or separation. In fact the subtitle is “a chain of short stories about their distance.” Since the subject of this review is a movie, I’ll be saying even less than usual about the plot to avoid spoilers. Nice lighting, especially the dappling on the wall. I said I wouldn’t provide plot spoilers, but I do feel the need to warn potential viewers that this film is very emotional, and not in a feel-good way. This is a very Japanese romance story, full of sentimentality and yearning. A recurring image is the falling cherry blossom, which is emblematic of the Buddhist notion of the transience of beauty, and the Japanese reversal of that notion: the beauty of transience. Humanity is tiny and inconsequential, compared to the vastness of the sky. 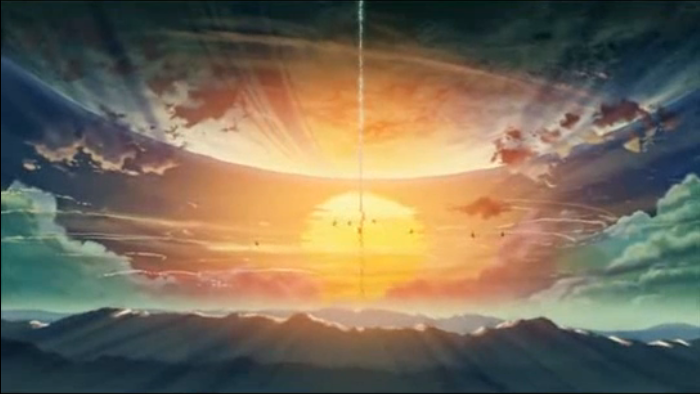 Even before 5 Centimeters Per Second, there were those who spoke of Makoto Shinkai as the “new Miyazaki”. Mr. Shinkai has laughed off such comments as exaggeration, but they raise an interesting point. As much as I am enjoying Occult Academy this season, the claim that anything that has been offered by the Anime no Chikara (“Power of Anime”) time slot truly represents the power of anime’s potential is easily disproved. There is far more intensity and beauty and wisdom in this short film than the entirety of the Anime no Chikara production to date. Perhaps it is unfair to hold a commercial, mass-market TV slot up for comparison to an art-house film that was obviously a labor of love, but their cheap marketing gimmick invites the comparison; meanwhile Mr. Shinkai quietly downplays his own accomplishments. A film of startling beauty. When you are considering which anime to pick up next, you have many choices. The anime production industry is happily churning out clones of past hits. And sometimes all you want is mindless entertainment, so there’s nothing inherently wrong with another show about over-powered poseurs that scream at each other righteously, or buxom, cat-eared maid dolls. If, however, you haven’t seen 5 Centimeters Per Second, and you can spare 60 minutes for something unlike the formula recreations, give it a try. Ah 5cm/Sec always makes me emotional. 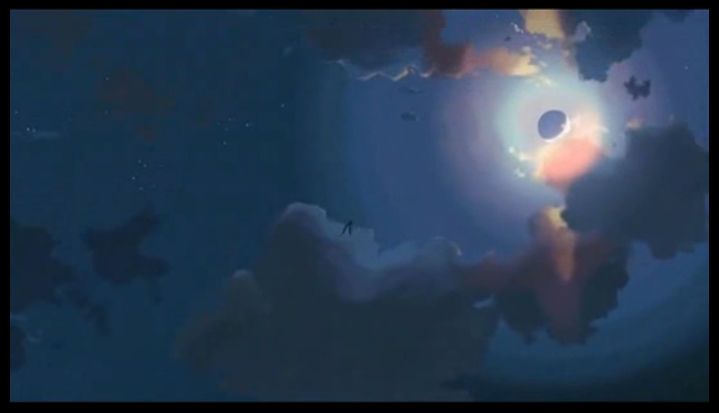 Its so breathtakingly beautiful and poignant that I get completely sucked in everytime I watch it ;_; Its amazing how well a movie can get emotion across with so little dialogue – the music and visuals are just that good! 5cm/s’ breathtaking visuals are sharply contrasted by the build up to the very realistic and painful moral towards the end. It still remains very high in my books ’till this day. I guess it is just a sign of the times that it is out of print, at least here in the states. I checked online, and a DVD copy would set me back 130 bucks. I suppose that’s fair, in the sense that it is an artistic achievement, but seriously it only costs that much because there are so few copies floating around, which ultimately means very few people will get a chance to enjoy it fully. That’s a real shame. Ah, sounds good… I’ll make time to go watch it. I’m glad there are still some people with taste out there! I had the pleasure of purchasing an artbook of Makoto Shinkai’s work at a convention last year. It consists mainly of landscape and city illustrations that are used in his movies, so they’re usually empty of people. But even in these environmental portraits, he blends light and dark and colors in beautiful ways. It sounds paradoxical, but he’s able to create such moving images even in complete stillness. The title of the artbook — Sora no Kioku — I think sums up what he tries to capture: that the sky or the field or the city street is alive with memories and emotions, even if no one is there. Wow, that sounds really interesting, and well worth checking out. Shinkai is definitely a true artist. I understand what you mean, because there was so much beautiful detail in the background of his movies. I guess I would have to agree. I was quite impressed that even at the very beginning the movie develops that sense of loss. I think, however, that an argument could be made, that the final two-thirds are “healing”, in the sense that we might never get over the loss of a loved one, but we can learn to get on with our lives.